Wow. That’s the only response to this. Adobo is a Mexican paste made from dried chillies, herbs and vinegar and will, once you’ve tried it, become one of the most useful things in your refrigerator (and it will change your experience of pork chops for ever). There are lots of different versions – some people add cloves, others bitter orange juice instead of vinegar – and the type of chilli used varies too. This is my own version, but feel free to adapt it as you want. I particularly like sherry vinegar in this (though a Mexican would not use it), as it gives a lovely, deep, ‘woody’ flavour. Brown sugar isn’t usual either but, again, it gives depth. This amount gives you enough paste to make two Mexican-flavoured meals for six people. Toast the chillies in a dry frying pan; you don’t want to char them, just make them more pliable (the heat softens them). Discard the stems, and the seeds from all the chipotles and half the anchos. Put both types of chillies in a small saucepan and cover with water. Bring to a boil, then pull off the heat and leave to soak for 30 minutes. Strain the chillies, reserving the soaking liquid. ´Toast the whole spices in a dry frying pan until they are fragrant (about 40 seconds). Now put all the ingredients into a food processor and whizz to a purée, adding enough of the chilli soaking liquid to get it to the consistency of a paste. Taste for seasoning and adjust if you think it needs it. 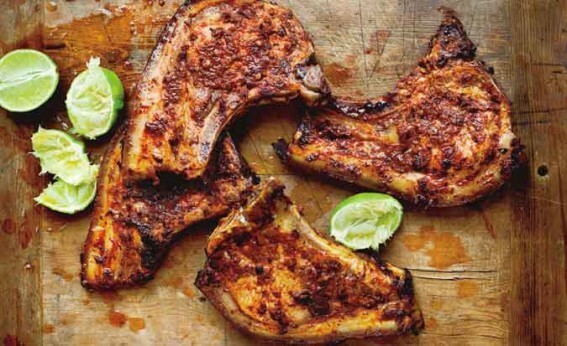 Spread 125ml (4 fl oz) of the adobo over the chops (keep the rest in the fridge for another dish) and leave to marinate, ideally overnight (in the fridge) but for 30 minutes at least. Let them come up to room temperature if you've had them in the fridge. Place in a roasting-tin and cook for 20 minutes in an oven preheated to 190°C/375°F/gas mark 5, covering with foil after 15 minutes. Transfer the meat to a warm serving dish and spoon the juices over the top. Scatter with the coriander and serve with guacamole or avocado salsa, wedges of lime, green salad and boiled rice. You could also spread this over chicken joints. Ideally marinate overnight, but I often leave them for just 30 minutes and cook for about 40 minutes at 180°C/350°F/gas mark 4. You can also use adobo as a sauce, adding a generous amount (about half of this recipe) to the braising liquid in a casserole of pork and chorizo.